Dasatinib is an orally active small molecule kinase inhibitor of both the src and abl proteins. To evaluate the potential role of dasatinib in breast cancer we used 39 human breast cancer cell lines that have been molecular profiled using Agilent Microarrays. They represent both luminal and basal breast cancer subtypes based on the relative gene expression of cytokeratin (CK) 8/CK18 and CK5/CK17, respectively, and those that have undergone an epithelial-to-mesenchymal transition (post-EMT) based on their expression of vimentin and the loss of CKs. When treated with 1 μM dasatinib in vitro 8 of them were highly sensitive (>60% growth inhibition), 10 of them were moderately sensitive (40–59% growth inhibition), and 21 were resistant to dasatinib. A highly significant relationship between breast cancer subtype and sensitivity to dasatinib was observed (χ 2 = 9.66 and P = 0.008). Specifically, basal-type and post-EMT breast cancer cell lines were most sensitive to growth inhibition by dasatinib. In an attempt to identify potential predictive markers of dasatinib response other than breast cancer subtype we analyzed the baseline gene expression profiles for differentially expressed genes. We identified a set of three biologically relevant genes whose elevated expression is associated with dasatinib inhibition including moesin, caveolin-1, and yes-associated protein-1 with a sensitivity and specificity of 88 and 86%, respectively. Importantly, these data provide scientific rationale for the clinical development of dasatinib in the treatment of women with “triple-negative” breast cancer, a subtype that is categorized as being aggressive and lacking effective treatments (i.e. hormonal manipulation or trastuzumab). Breast cancer affects over one million women worldwide every year [1, 2, 3]. 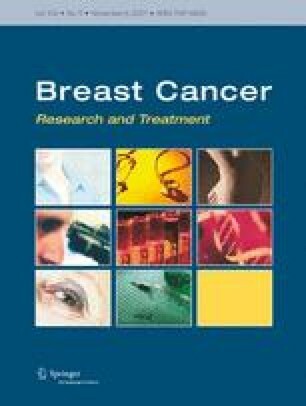 Advances in our understanding of the biology of this disease have lead to improved patient survival with incorporation of new anti-hormonal agents in the treatment of hormone receptor positive disease and the addition of HER-2 directed therapies for the 25% of women with HER-2 amplification [4, 5]. There remains however, a subset of women for whom these approaches are not an effective option and chemotherapy offers only limited benefits. This group has been described as “triple-negative” (i.e. estrogen receptor negative, progesterone receptor negative, and HER-2 negative) and represents a distinct clinical and molecular subgroup of the disease. Recent studies using gene expression profiling have identified this group as expressing unique cytokeratins that differentiate it from other types of breast cancer and as having a similar poor prognosis to the HER-2 positive group prior to the introduction of trastuzumab [6, 7, 8]. Profiling data have subgrouped the disease into “luminal”, expressing specific cytokeratins (CK8, CK18) associated with the luminal layer in the normal breast epithelium, or the “basal” group based on the expression of cytokeratins (CK5, CK17) found in the basal layer of the breast epithelium. ER+ and HER-2 amplified disease may occur in both subtypes, whereas the “triple-negative” breast cancers are generally of the basal subtype [6, 7, 8, 9]. In addition, there exists a subset of “triple-negative” breast cancers that also express vimentin. This group is felt to represent breast cancers that have undergone an epithelial-to-mesenchymal transition (EMT) and has been associated with clinical disease that is more invasive, has a higher mitotic index, and also has a worse clinical outcome [10, 11]. Taken together, these data demonstrate that the identification of new therapies with activity in the basal subtype of breast cancer is a clinical priority. c-src is the cellular homolog of the viral oncogene v-src and is the prototypic member of a family of non-receptor tyrosine kinases that play a key role in many cellular signaling pathways that involve proliferation, differentiation, survival, motility, and angiogenesis. Aberrant expression and activation of src-family kinases have been implicated in a number of human malignancies but thus far they have not proven to be effective clinical targets [12, 13]. Despite this, molecular studies continue to show src to play a potential role in clinically important pathways in breast cancer including the steroid and peptide hormone signaling pathways [14, 15]. Dasatinib is an orally active small molecule inhibitor of both the src and abl proteins with IC50s for the isolated kinases of 0.55 and 3.0 nM, respectively . Recently, dasatinib was approved for the treatment of imatinib refractory chronic myelogenous leukemia (CML) and bcr–abl positive acute lymphoblastic leukemia (ALL) [17, 18]. To determine the potential clinical role of a src-inhibitor in breast cancer, we examined the in vitro effects of dasatinib in an unbiased fashion using a panel of 39 human breast cancer cell lines that have been characterized using transcriptional profiling with the Agilent platform . These studies demonstrated that dasatinib significantly inhibited proliferation of those cells lines that represent the basal subtype of human breast cancer. In addition, there was a minority of luminal-type cell lines that also demonstrated some sensitivity to dasatinib. Using the baseline gene expression profiles for this panel of cell lines, we generated a three-gene “predictive” set with a high sensitivity and specificity (88% and 85%, respectively) that identifies those breast cancer cells most likely to respond to dasatinib. Caveolin-1 (CAV1), moesin (MSN), and yes-associated protein (YAP1) were not only found to be differentially expressed in the most sensitive cell lines, but their association with src signaling pathways lends credence to their relevance as potential biomarkers. The observation that dasatinib preferentially inhibited the growth of basal-type breast cancer cell lines has also been made independently and simultaneously by Clark et al. using a different array platform (Affymetrix), different cell lines, and different assays for proliferation. Together, these data support the clinical testing of dasatinib in breast cancer, and specifically the “triple-negative” population, which at this time represents an unmet medical need. The effects of dasatinib on cell growth were studied in human breast cancer cell lines growing in vitro. The cell lines MDA-MB-415, MDA-MB-134, HCC-1500, ZR-75-30, HCC-202, HCC-1419, HCC-38, HCC-70, HCC-1187, HCC-1806, HCC-1937, HCC-1954, MDA-MB-436, HCC-1569, Hs578t, HCC-1143, MDA-MB-175, BT-474, SK-BR-3, MDA-MB-361, UAC-893, UACC-812, UACC-732, T-47D, MDA-MB-453, MDA-MB-468, CAMA-1, MDA-MB-157, MCF-7, MDA-MB-435, ZR-75-1, BT-20, and MDA-MB-231 were obtained from American Type Culture Collection (Rockville, MD). The cell lines EFM-192A, KPL-1, EFM-19 and CAL-51 were obtained from the German Tissue Repository DSMZ (Braunschweig Germany), and the cell lines SUM-190 and SUM-225 were obtained from the University of Michigan (Ann Arbor, MI). MDA-MB-134, MDA-MB415, MDA-MB-436, MDA-MB-175, UACC-893, UACC-812, and MDA-MB-157 cells were cultured in L15 medium supplemented with 10% heat-inactivated fetal bovine serum (FBS), 2 mmol/l glutamine and 1% peniclin G-streptomycin-fungizone solution (PSF, Irvine Scientific, Santa Ana, CA). CAL-51, KPL-1, Hs578t cells were grown in DMEM supplemented with 10% heat-inactivated FBS and PSF, as above. SUM-190 and SUM-225 cells were cultured in HAM’s F12 supplemented with 5% heat-inactivated FBS, PSF, 5 mg/ml insulin and 1 mg/ml hydrocortisone. The remaining cell lines were cultured in RPMI 1640 supplemented with 10% heat-inactivated FBS, 2 mmol/l glutamine, and PSF. Agilent microarray analyses were developed for each cell line . Briefly, cells were grown to log phase and then RNA was extracted using the RNeasy Kit (Qiagen). The purified RNA was eluted in 30–60 μl DEPC water and the quantity of RNA measured by spectral analysis using the Nanodrop Spectrophotometer. RNA quality was determined by separation of the RNA via capillary electrophoresis using the Agilent 2000 Bioanalyzer. Microarrays of breast cancer cell lines were then performed on the Agilent Human 1A V1 chip. Characterization of individual breast cancer cell lines by comparison to a breast cell line mixed reference pool was conducted on a single slide in which the mixed pool RNA was labeled with cyanine-3 and the individual cell lines with cyanine-5. The mixed reference pool consisted of equal amounts of cRNA from ten breast cancer cell lines that were selected to be representative of a range of the various known breast cancer subtypes based on their expression of specific molecular markers, e.g. ESR1, HER-2, EGFR, as well as growth characteristics. The reference includes the following cell lines: 184B5, MDA-MB-468, MDA-MB-157, MDA-MB-231, MDA-MB-175, CAMA-1, MCF-7, MDA-MB-361, SK-BR-3, and DU4475. Microarray slides were read using an Agilent Scanner and the Agilent Feature Extraction software version 7.5 was used to calculate gene expression values. Extracted data was imported into Rosetta Resolver 5.1 to create expression profiles for each individual breast cell line experiment. Cluster analysis was performed in Resolver and cell line profiles were exported to Excel (Microsoft) for additional analysis of the distribution of gene expression changes across the various subtypes and the individual cell line response data. Cells were seeded in duplicate at 5,000 to 10,000 cells per well in 24-well plates. The day after plating, dasatinib was added at a final concentration of 1 μM. Control wells without drug were seeded as well. Both the adherent and floating fractions of cells were counted on days 2, 5 and 7 for both treatment and control wells. After trypsinization cells were placed in Isotone solution and counted immediately using a Coulter Z2 particle counter (Beckman Coulter Inc, Fullerton, CA). Growth inhibition was calculated [(1-experimental value/control value) × 100] for each day adding both the values obtained for the floating cells and the adherent cells. Pearson Chi-squares analysis was performed to identify a correlation between subtype and sensitivity to dasatinib. Dasatinib was provided by Frank Lee at Bristol-Meyers-Squibb. Pearson Chi-squared tests were performed using Statistica 7.1 (Statsoft Inc) to determine the relationship (if any) between subtype and dasatinib response. Genes potentially related to response were determined by analyzing the distribution of samples with significant expression changes across cell line groups defined by subtype and response for each gene. The threshold for up-regulation was set to log (ratio) >0.13 with a P-value < 0.01 and down-regulation was defined as log (ratio) <−0.13 with a P-value < 0.01. The P-values were determined according to the Agilent error model when the feature-extracted data was imported into Resolver. Gene ontology and pathway information was used to further constrain the set of candidate markers. Clustering was then used to visualize expression of candidate markers across all the cell lines tested for dasatinib response to develop a potentially sensitive and specific “response predictor marker set” of genes. A total of 39 breast cancer cell lines were categorized as representing luminal or basal breast cancer subtypes based on the relative gene expression of cytokeratins (CK) 8/CK18 and CK5/CK17, respectively. In addition, several cell lines were classified as representing breast cancers that had undergone an epithelial-to-mesenchymal transition (post-EMT) based on their expression of vimentin and the loss of cytokeratin expression. A cluster diagram of the 39 breast cancer cell lines versus 5 subtype markers was developed (Fig. 1). The cell lines that show mixed cytokeratin expression were classified as primarily basal based on the lack of expression of several additional well-characterized luminal markers: e.g. estrogen receptor, E-cadherin (CDH1), and GATA3 (Data not shown.) The relative expression of the above markers as well as estrogen receptor and HER-2 expression levels were used to assign the various cell lines into previously clinically defined subtypes [6, 7, 8]. Response to dasatinib was then assigned to each cell line along with the subtype of breast cancer it represents (Table 1). Proliferation responses were based on the level of inhibition at 1 μM of dasatinib with those cell lines having greater than 60% inhibition being assigned to the highly sensitive group, those with 40–59% inhibition being assigned to the moderately sensitive group, and those with <40% inhibition at 1 μM assigned to the resistant group. This separation was based on the fact that serum concentrations greater than 1 μM are unlikely to be achieved in patients with solid tumors (BMS personal communication). The moderately sensitive and highly sensitive cell lines were grouped as “Sensitive” in the Chi-square test and demonstrate a highly significant relationship between sensitivity to dasatinib and the basal subtype of breast cancer cell lines with χ 2 = 9.66 and P = 0.008 (Table 2). In addition, there were some luminal cell lines that demonstrated moderate sensitivity to dasatinib (Table 1). We therefore sought to identify a specific gene subset that might allow us to identify all cell lines that are responsive to dasatinib with a high sensitivity and specificity. Using the baseline gene expression profiles, we developed data matrices of differentially expressed genes in an attempt to identify potential predictive markers of dasatinib response. Initially genes were sought that differentiated the sensitive basal cell lines from resistant basal and luminal cell lines. This analysis yielded both moesin and caveolin-1 as potential discriminators. Next, using a similar technique we sought to identify genes that discriminated between the luminal cell lines that were sensitive and resistant. yes-associated protein-1 (YAP-1) was identified based on its differential expression between the two groups and potential biologic significance since YAP-1 is a protein with relevance to src signaling. It is a 65 kD protein that binds to the gene product of the src-family kinase yes . The relative expression levels of these three genes in the cell line panel and their associated response to dasatinib in vitro was evident (Fig. 2). Detection of any one of these three markers above the reference level is predictive of an in vitro response to dasatinib with a sensitivity and specificity of 88% and 86%, respectively (Table 3). The successful development of targeted therapeutics in oncology has been hindered by the lack of reliable predictive markers for response for any given agent. Notable exceptions thus far have been the use of hormone receptor measures  and tests for the presence of the HER-2 alteration [23, 24, 25, 26]. Unlike these two examples, it has now become clear that for a number of potential targets, simple measurement of gene expression in clinical material may not necessarily translate into clinical response or benefit for patients [27, 28]. Ideally, as a novel agent enters the clinic, a target population of patients can be prospectively identified that will likely benefit from that agent and this information can then be used to guide clinical trial design. In the current study, a large panel of human breast cancer cell lines was molecularly characterized using gene expression profiles in an unbiased fashion in order to identify any subtype of breast cancers that may be more likely to respond to dasatinib treatment. Using a large panel better encompasses the molecular heterogeneity of clinical breast cancers, including hormonally driven disease, HER-2 amplified disease, and “triple-negative” breast cancers. This panel was then used to test the biologic effects of the multi-targeted kinase inhibitor dasatinib. The effects of dasatinib on proliferation were determined in an unbiased fashion by testing the entire panel at 1 μM dasatinib. Recent reports describe an additional approach to identify signatures of oncogenic pathways by using DNA microarrays of mammary epithelial cultures transfected with genes of interest, including src . While aberrant activation and expression of src has been implicated in breast cancer, its critical role has not been associated with any distinct molecular phenotype. In this study we found a strong association between in vitro sensitivity to dasatinib and the basal (“triple-negative”) subtype of human breast cancer. Given the large amount of data surrounding the role of src in HER-2 signaling, our hypothesis would be that dasatinib might be active in cell lines with HER-2 amplification, however, most of these cell lines were relatively resistant to monotherapy with dasatinib (11 of 15). In addition, the majority of sensitive cell lines are steroid receptor low or negative. Together, these characteristics alone define, in part, the “triple-negative” group of breast cancer. Using the baseline expression arrays we were able to further discriminate “responsive” cell lines using the differential expression of three genes: moesin, caveolin, and yes-associated protein-1 with a high sensitivity and specificity (88% and 86%, respectively). While other genes may be derived from the analysis of large microarray datasets, the biologic relevance of these genes makes them plausible predictive markers for defining a population of breast cancers that may respond to a src-targeted therapeutic like dasatinib. In addition, both moesin and caveolin-1 have been identified as markers for basal breast cancers [30, 31]. Caveolin-1 interacts closely with the src family kinase (SFK), fyn, in linking integrins with ras-ERK signaling in the focal adhesion pathway as well as other SFKs [32, 33]. Moesin is a member of the ERM (Ezrin/Radixin/Moesin) family of proteins which have been shown to interact with src in adhesion-mediated signaling [34, 35]. As stated above YAP-1 directly interacts with src and another SFK proto-oncogene yes, possibly in the tight junction and adherens pathways [21, 36]. The src oncogene was the first transforming gene described, however until recently it was not pursued aggressively as a target in oncology. Unlike v-src, the human cellular homologue c-src was found to be only tumorigenic and felt by some not to play a large role in the pathogenesis of human malignancies . Recently, however, aberrant activation and expression of c-src has been associated with human disease, including malignancies of the lung, skin, colon, ovary, endometrium, head and neck area and breast . This has lead to the current hypothesis that c-src may facilitate the action of other signaling proteins, rather than being a dominant transforming agent. On its own, c-src interacts with a number of cellular factors including the cell surface receptors of the EGFR family, CSFR-1, PDGFR, and FGFR as well as integrins, cell-cell adhesion molecules, steroid hormone receptors, components of pathways regulated by G-protein coupled receptors, and focal adhesion kinases (fak), as well as adapter proteins such as shc and many others . As a result of its role in these critical pathways c-src is likely to play a key role in the regulation of proliferation, differentiation, survival, motility, angiogenesis, and functions of differentiated cells . It is known that alterations in several of these processes are characteristic of the malignant phenotype . The current data from our group as well as data independently generated by Clark et al. indicate some dependence on src signaling pathways in the basal subgroup of breast cancers in vitro. Other recent research has supported the role of src inhibition with dasatinib in head and neck, pancreatic and lung cancer models as well [38, 39, 40]. Finally, mutations in the abl kinase are the defining alteration in chronic myelogenous leukemia and have been the basis for molecular targeting of that disease initially with imatinib and now dasatinib. An alternative explanation for the current results could be based on new data implicating abl in breast cancer. Evaluation of abl activation in a panel of 8 breast cancer cell lines has shown constitutive activation of abl in “aggressive breast cancer cells” without increases in abl gene expression . These cell lines included many that were evaluated in our panel, including MDA-MB-468, MCF-7, BT-474, SK-BR-3, MDA-MB-231, MDA-MB-453, and UACC-893. Interestingly, these authors described significantly increased abl activity in the MDA-MB-231 and MDA-MB-435 cells. In the current study, these cell lines are among those highly sensitive to dasatinib and are classified as post-EMT due to their expression of high levels of vimentin. Also of interest is the observation that the basal cell line MDA-MB-468 was one of only 3 basal cell lines that we found to be resistant to dasatinib and in the study implicating abl this cell line had a low level of abl activation . These data raise the possibility that abl inhibition is another potential mechanism of dasatinib activity in basal breast cancer cell lines. The final determination of which of these two signaling pathways, i.e. src or abl, may be critical in basal breast cancer will clearly require further study. The pre-clinical in vitro activity of dasatinib in basal breast cancer cell lines and the associated gene profile will require validation in a clinical setting. In the current study we concentrated on gene expression profiles. mRNA studies may miss other important regulators of protein levels or activation such as post-translational modifications. However, two independent groups using different array platforms and proliferation assays have now made the observation that dasatinib is considerably more active in basal-type breast cancer pre-clinically. Currently, there are clinical studies planned to evaluate dasatinib in solid tumors including breast cancer, enriching for patients with “triple-negative” or basal disease. Dasatinib may represent a new therapeutic option for women with this breast cancer subtype that has traditionally been associated with a poor prognosis. Of note, recently this subtype has also been shown to be increased in young African-American women with breast cancer . The pre-clinical platform we applied to the study of dasatinib has provided a hypothesis that is now ready for testing in the clinical setting.